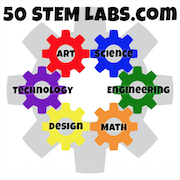 This is a collection of 50 STEM (Science, Technology, Engineering, & Mathematics) science experiments for kids. Recommended for grades 3 and up. Each one has a snappy title, a brief description of the task required, the rules, and grading rubrics. These are very adjustable for your classroom, home, or homeschool needs. They support learning in these technical fields in a fun, hands-on, and sometimes competitive way. Learn by doing, measuring, and designing, and then reflect upon it. Labs are tagged with categories so you can search for other similar labs. Types of labs included are: paper airplanes, bridge building, roller coasters, weight lifting projects, cars, crash tests, egg tests, and many, many more! Get your copies on Lulu or Amazon! 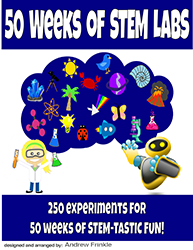 This my 2nd collection of 50 STEM (Science, Technology, Engineering, & Mathematics) science experiments for kids. Recommended for grades 3 and up. Each one has a snappy title, a brief description of the task required, the rules, and grading rubrics. These are very adjustable for your classroom, home, or homeschool needs. Labs are tagged with categories so you can search for other similar labs. Types of labs included are: arches, cantilevers, boats, catapults, rollercoasters, and many, many more! 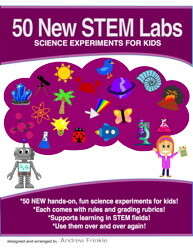 This my 3rd collection of 50 STEM (Science, Technology, Engineering, & Mathematics) science experiments for kids. Recommended for grades 3 and up. Each one has a snappy title, a brief description of the task required, the rules, and grading rubrics. These are very adjustable for your classroom, home, or homeschool needs. Labs are tagged with categories so you can search for other similar labs. Types of labs included are: machines, boats, fliers, catapults, towers, bridges, and more! 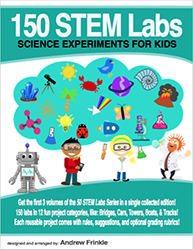 Get all 3 original volumes of 50 STEM Labs collected into one new book! This one not only takes all 3 books and puts them together, but it resorts them into about 12 major themes, like bridges, fliers, throwers, and materials strength tests. This makes it easier than ever to find similar units and do thematic units and monthly STEM themes. This my 4th collection of 50 STEM (Science, Technology, Engineering, & Mathematics) science experiments for kids. Recommended for grades 3 and up. Each one has a snappy title, a brief description of the task required, the rules, and grading rubrics. These are very adjustable for your classroom, home, or homeschool needs. This set is all focused on holidays and seasonal themes. 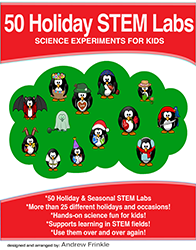 With over 25 holidays and occasions, it's probably the most complete STEM holiday resource on the net! 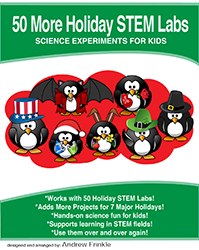 This my 5th collection of 50 STEM (Science, Technology, Engineering, & Mathematics) science experiments for kids. Recommended for grades 3 and up. Each one has a snappy title, a brief description of the task required, the rules, and grading rubrics. These are very adjustable for your classroom, home, or homeschool needs. This set adds more activities for the major holidays, like: Easter, Christmas, Thanksgiving, Halloween, St. Patrick's Day, Valentine's Day, and Patriotic Holidays. 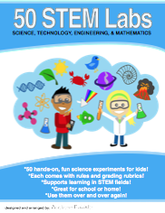 This my 3rd volume in the 50 STEM (Science, Technology, Engineering, & Mathematics) Labs Series. 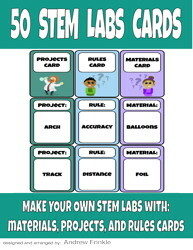 Unlike the others, this one is all in card form, so you can mix and match Projects, Materials, and Rules to make your own labs! It comes with 90 cards, some of them blank, so you can make thousands of combinations! 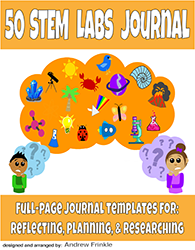 This book is volume #5 in the series, and it's an add-on with useful worksheets and record sheets you can use to help make your reports, reflections, and planning sheets for STEM and Science experiments. Get 14 different full-page spreads, with 2 copies of each. This book is volume #6 in the series, and it's an add-on or replacement for the other books in the series. Get 50 weeks X 5 Ideas per week for 250 project ideas. It does not have the grading rubrics or the details of books 1-3 though. These are brief suggestions for projects and the materials you will need for them.